Support MISD on Taco Tuesday! 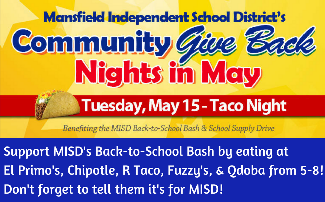 Please come support MISD's final community night of the 2017-18 school year at the following locations from 5-8 pm on Tuesday, May 15, 2018. Please don't forget to mention you are supporting MISD. A portion of the proceeds will help fund MISD's Back-to-School Bash.